Ewin Ee already got a clip video up from this past weekend’s 2012 Malaysian YoYo Championship, and it looks like everyone had a blast! New video from C3 YoYoDesign with Chinese player Ma Yi showing off their new plastic yoyo, the Alpha Crash. Check out the look on Ma Yi’s face at 1:18–PRICELESS. This video popped up on YouTube and there’s apparently been a lot of conversation about it on Twitter. Unfortunately, I can’t read Japanese and I don’t have a Twitter client that will translate so I have no idea what’s being said. But what I hope is being said is that this is, to my knowledge, the first time this trick has been captured on video in spite of the fact that it’s been around since at least the 1940s, possibly earlier. I’ve seen illustrations for the trick, and I remember talking to Dale Oliver about it in 1997, but he couldn’t do it. I first saw it done by Jon Gates around 200o-ish, but it was one of those late night oddities and we all just kinda went “Oh hey, cool” and left it at that. So this video is possibly the first time this trick has ever been filmed, and certainly the first time the trick has been seen by 99% of all yoyo players worldwide. Which is really pretty awesome. UPDATE: Rafael Matsunaga pointed out that the Figure 8 Loop was mentioned as the “Dragon Loop”, an insanely difficult and largely unattainable trick from the old “Chousoku Spinner” Hyper YoYo comics published in the late 90s. He sent me this scan, which is friggin’ awesome. YoYoJam has released a new video featuring 3A wunderkind Alex Hattori to promote his new signature yoyo, the Collid3r. Alex has a tremendous amount of skill for someone who’s only been playing for a few years, and he’s definitely a leading contender for any contest he enters. No release date or price yet for the Collid3r. Luke Finnell from the USA and Rodion Sahanko from Russia made this awesome video, from opposite sides of the world! These 2 are up and comers and we’re sure you’ll hear more from them in the future. This absolutely beautiful video features Taiwan offstring champion Kuo Po-han demoing the new Feng by Yonity. Pics and specs below. Here’s what happens when two kendama players end up on the same flight to Seattle. Great tricks from Kengarden’s Jake Wiens and Sam Merkel. New video from Cleveland YoYo Club member and YoYoFactory Protege Team Member, Darnell Hairston. Darnell is planning to attend and compete in a lot more contests next year…expect to see him at the Triple Crown of YoYo in Chicago, Indiana States, and more. 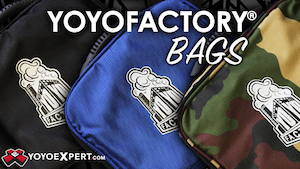 YoYoExpert just dropped some great throws by C3 YoYoDesign…well worth checking out! 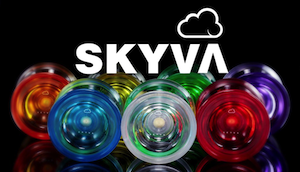 Alpha Crash is a high end plastic yo-yo based off their flagship model the Berserker. The angular shape focuses on aerodynamics and stability. This yo-yo screams speed and high performance play. Excellent for the player who has just perfected their bind return all the way to the freestyle player who wants to prove plastic can play as good as metal. The Glitter take a similar shape to C3′s flag ship model the Berserker. Strong angular design but a little smaller diameter making for a comfortable mid-size throw with a lot of stability and a lot of WOW factor. This is a one time only production of 100 yo-yos in honor of the exclusive 44CLASH event in Japan! And another in honor of 44CLASH edition yo-yo – the amazingly priced Capless! A black body with yellow and red flecks and the 44CLASH logo engraved in honor of the amazing contest in Japan. Freestyles are up from the 2012 Victoria Harbour YoYo Competition in Hong Kong! Additional videos are up on Here We Yo’s YouTube channel. Hyper Yo-yo is at full power during the Winter World Hobby Fair in Japan! Japan’s biggest toy event, World Hobby Fair, will once again host a huge Hyper Yo-yo event in each of its venues. The Hyper Yo-yo booth will feature the usual shows from the “Hyper Spinners” Tyler, Tiger and Shun, as well as the unveiling of a new member of the Hyper Yo-yo demo team, presumably replacing Zero, the last Duncan Hyper Spinner. Regional contests will also be held in each event site, and although details are scarce at this point regarding the format, the event site notes that winners will be the official representatives of each region in an upcoming National contest. A “Hyper Yo-yo School” will be available to all newcomers during the whole event at each venue. Miguel Correa just posted up the beginning of a great series on Response in Unresponsive YoYos, a discussion on bearings. If you aren’t already subscribed to his site, Definitive YoYoing, you should be. Your yo-yo of choice is about trade offs. Size, weight, and material are factors in a yoyo that you cannot change (generally speaking). Your choice of bearing, however, is a variable. There are many types of bearings; steel, spec, ceramic, center trac, concave, the list goes on. Those all have their own traits and marketing behind them, but what I want to focus on are physically different bearings, Flat vs. Curved.